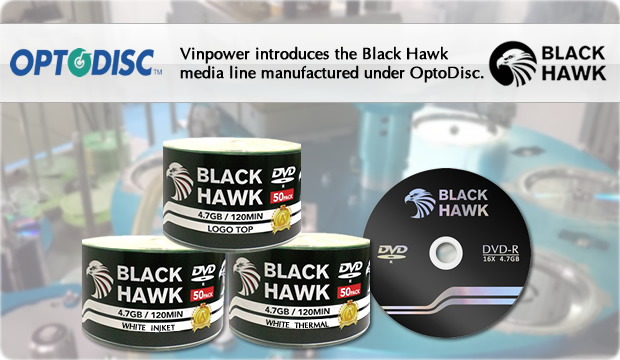 Vinpower introduces the Black Hawk media line manufactured under OptoDisc. â€¢	Backwards compatible, so the Optodisc media line is recognized and supported through older legacy drives for optimal compatibility. There is so much more to discover about Vinpowerâ€™s Black Hawk media line, you should see the benefits for yourself. 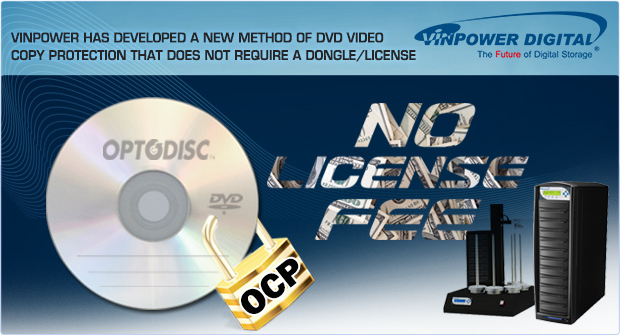 Vinpowerâ€™s line of OCP Duplicators, offers DVD copy protection, that does not require a dongle or any expense to implement licenses on either the master or the subsequent copies. This line of duplicators, now with updated firmware to enhance the copy and protection process, can simply implement DVD Video copy protection by using any OptoDisc MID recordable DVD. The process is related to a direct correlation between the duplicatorâ€™s controller, the writer drives, and select primary OptoDisc media working together to implement a suitable DVD Copy Protection with virtually no effort or expense. This line of Copy Protection through a standalone duplicator, available for both manual towers and autoloaders, offers a unique blend of both cost savings and added protection against copyright theft. If you prefer not to allow others to copy your DVD video content, but donâ€™t have the funds or the necessity to pay the added cost of Vinpower higher end BCP or AACS implementations, then Vinpowerâ€™s latest offering and FW update is the perfect solution for you. 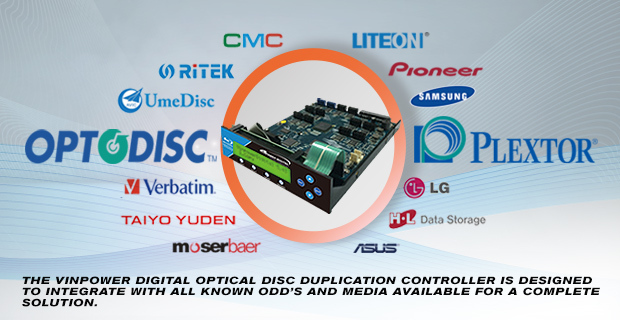 The Vinpower Digital optical disc duplication controller is designed to integrate with all known ODDâ€™s and media available for a complete solution. Vinpower has long been known as one of the most reliable duplication hardware manufacturers, but the key to our success lies in the high quality of our standalone duplication controller. Vinpower is currently the largest global supplier of digital duplication controllers. This has stemmed from the overall reliability and high quality of our controllers as well as the key that the Vinpower controller can work with all known OODâ€™s and medias on the market today, as well as operate special functions with select drives and media. These added benefits, enable those who wish to build their own duplicators the confidence that they can use any ODD burner and Optical Disc media currently available on the market. The key is that the Vinpower controller not only works with all known ODDâ€™s, but it can also perform that specific driveâ€™s firmware update for the drive or multiple drives simultaneously. This is a huge benefit as ODDâ€™s constantly have FW updates and previously those drives would have to be removed from the duplicator and attached to a computer one by one to perform the FW update. This is a tedious and time consuming task, but with the Vinpower controller, you can update all the drives in the duplicator at once in a couple of minutes without any hassle or complications. In addition, some duplicators or drives, when they become worn, have issues burning certain medias and create longer duplication times or higher failure rates. Vinpowerâ€™s controller recognizes these variances in the methods that driveâ€™s burn media at during various stages in its production cycle and helps compensate through managing the duplication process. This not only extends the lifecycle of the drives, but also reduces the number of failed burns produced by the duplicator(s) as well. Ultimately, the Vinpower controller is a cost savings tool in that it lowers the rate of failed discs and extends the longevity of the burners, which reduces overall expenses and increases performance. 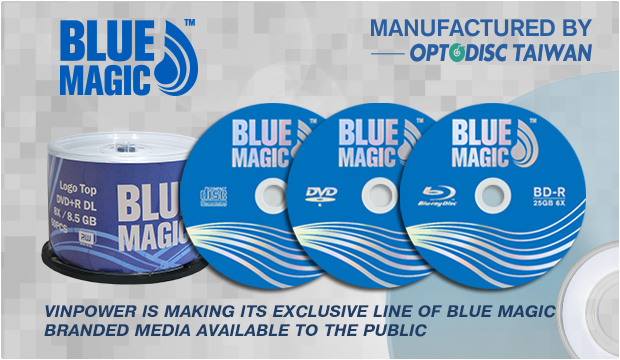 Blue Magic was created as an exclusive brand for a select territory, but that exclusivity has now expired and now we are making it widely available to the expanded market. Blue Magic is manufactured in Taiwan under the strict QC standards of Vinpowerâ€™s Media Control Division. Blue Magic was developed for the professional duplication market which requires constant duplication with non-stop production. We created Blue Magic to meet the rigors of the duplication market with minimal to no failure rate, yet maintain a high quality compatibility and playback capability.